Luckily, SEO isn’t about getting every tiny thing right; it’s about getting your priorities right. Below, we’ve put up a list of top eight rankings factors, based on the industry studies by SearchMetrics, Backlinko and SEO PowerSuite. Read on to find what they are, and how to optimize your site for each. Surprise, surprise, right? In 2017, backlinks continue to be the strongest indication of authority to Google. Let’s look at the things that can make or break yours. How does Google turn the abstract concept of “backlinks” into a quantifiable ranking signal? In several patents, Google explains that this is done by calculating a “link score.” The score is made up by every incoming link’s individual quality score (aka PageRank) and the number of links to the site. So link quantity is an important part of the score. However, remember that you can’t afford to have spammy, low-quality links in 2017. It’s also worth noting that links coming from the same domain carry little weight; Google will typically only count one of them when evaluating your link profile. So in terms of quantity, your primary factor to focus on should be the number of linking domains. Measuring quality is less straightforward. While we know that PageRank is still one of the key factors in Google’s algorithm, its public version is no longer available. Luckily, there are reliable alternatives that are based on PageRank’s original formula, including SEO PowerSuite’s recently launched InLink Rank. Anchor text is another part of the “backlinks” concept that matters for rankings. Much like the content on your pages, your backlinks’ anchors tell Google what your page is about — and what it should rank for. Of course, you’ve got to remember about Penguin and keep your anchors diverse and natural; it’s all about striking the right balance. But what is this “right balance?” Alas, there’s no universal answer. Still, these anchor text averages (across various industries) may give you a hint. Checking on your SEO competitors’ links is a good way to understand what kind of link scores you are competing against, and how much work it’ll take to catch up. To do this, you’ll need a tool that lets you compare several sites’ link profiles against numerous criteria. SEO SpyGlass with its Domain Comparison module does this brilliantly. Fire up the tool and create a project for your site, then jump to Domain Comparison and add the domains of your major competitors, one by one. In a second, you’ll see how every aspect of your link profile compares to your rivals’. All right, content is king. But what is Google looking for in quality content, exactly? Here are the three things that make a difference. Your title remains the strongest relevance signal to Google. Using keywords or variations in the title tag is still important in 2017 (the closer to the beginning, the better). The meta description can also boost relevance, although it carries less weight. Finally, don’t forget about using keywords in the page’s body, remembering that the H1 tag holds the most SEO weight out of all headings. For a realistic reference on the “satisfying amount” of content, look at the pages that already rank well for your keywords, and learn from their strategies. RankBrain (launched in October 2015) forms part of Google’s Hummingbird algorithm and, according to Google, is involved in every query. One of RankBrain’s functions is analyzing results with good user satisfaction metrics and identifying their common features — features that make them good search results. Because most of online content is text, such features are often certain terms and phrases used on the page. Think about it: if you search for “things to see in new york,” it’s only logical that the comprehensive results will mention “times square.” “central park,” “empire state building” and so on. But it’s not always that obvious. Did you know all of the top 10 results for “best new york bagels” mention “cream cheese”? WebSite Auditor is the tool that lets you check pages against numerous on-page factors, including keyword usage and content length. 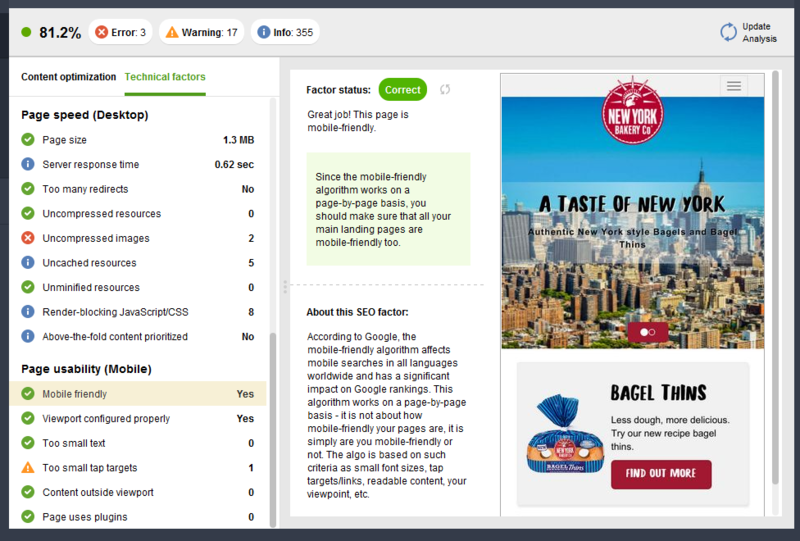 The tool will also analyze your pages’ comprehensiveness using the TF-IDF algorithm and give you recommendations based on your top competitors. To start, launch WebSite Auditor, create a project, and go to Content Analysis. Specify the page you’re optimizing and enter your target keywords. 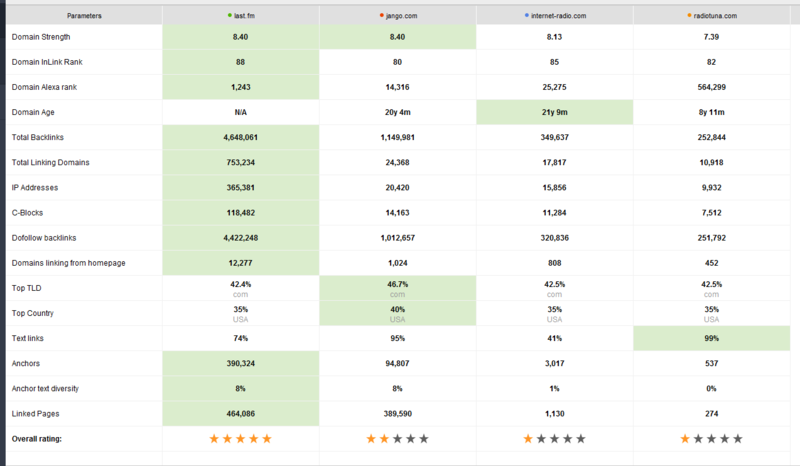 Look through the on-page factors for stats and recommendations on keyword usage, and check with the Competitors tab to see how your top competitors handle any given page element. Next, look at Word count in body and check how it compares to competitors’. Finally, switch to the TF-IDF dashboard for a list of terms that many of your top competitors use (remember RankBrain?) and specific usage advice for your content. Use these insights as inspiration to make your page more relevant and comprehensive. Now, it’s time to make changes to your page. Jump to Content Editor and optimize away! When you’re done, hit the save button in the top right corner to download the optimized HTML to your hard drive, ready for upload to your site. The technical foundation of your site is crucial for SEO (and well beyond). Here are the top two factors that matter for rankings. Google expects pages to load in two seconds or less, and they’ve officially confirmed that speed is a ranking signal. Speed also has a massive impact on UX: slower pages have higher bounce rates and lower conversion rates. The most common culprits for poor speed are uncompressed resources: scripts, images and CSS files. If your pages aren’t optimized for smartphones, they won’t rank in mobile search at all. With over half of Google queries coming from mobile devices, that’s not something you can put up with in 2017. The focus on mobile will likely continue with Google’s commitment to switch to mobile-first indexing soon. To check if your page passes Google’s mobile and speed tests, go to Content Analysis > Page Audit in WebSite Auditor and switch to Technical factors. Examine the Page usability (Mobile) and Page speed (Desktop) sections, and click on any factors with Error or Warning statuses for details and how-to-fix advice. A SERP (search engine results page) click-through rate (CTR) is the ratio of the number of times a search listing was clicked to the number of times it was displayed to searchers. Numerous patents filed by Google focus on CTR as a ranking signal. 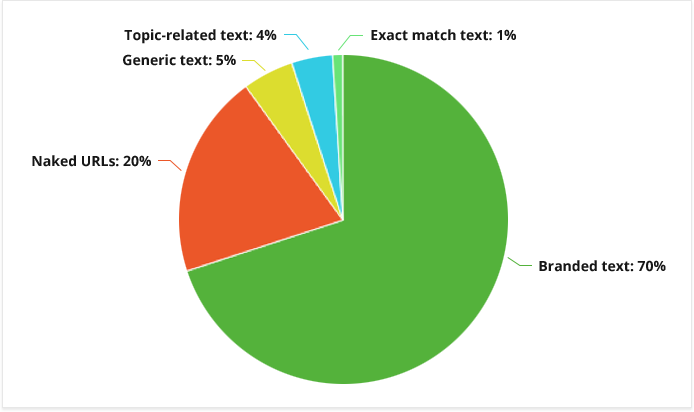 SearchMetrics’ study even found that CTR has the highest correlation with rankings out of all factors examined. True, correlation doesn’t equal causation. But it’s hard to argue with real-life experiments showing that a CTR increase almost immediately results in a ranking boost. The first thing to check is your current SERP CTR. In Google Search Console, go to the Search Analytics report and select Clicks, Impressions, CTR and Position. While CTR averages vary depending on the type of the query, as a rule of thumb, you can expect a 30 percent CTR for a #1 result, 15 percent for #2, and 10 percent for #3. If some of your listings’ CTRs are seriously below these averages, these are the low-hanging fruit to focus on. Think of how you can make your snippets click-worthy and look into competitors’ listings for inspiration. 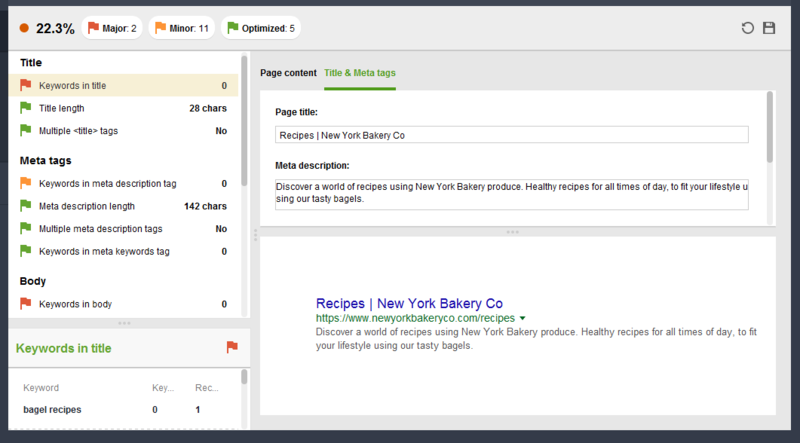 To edit and preview your Google snippet , open WebSite Auditor, go to Content Analysis > Content Editor, and switch to Title & Meta tags. Once you’re happy with it, hit the save button to download the HTML file to your hard drive. SEO is a complex, multidimensional, ever-evolving science. It’s only natural that you can’t afford to focus on every detail; and you don’t have to, either. If you prioritize your efforts, focus on the eight factors above, and remember to watch competitors closely, you’re sure to come out ahead of them in the SERPs.